Fr. Zacharia, author of Truth through the Creator’s Prism, was born Sargis K. Saribekyan in Yerevan, Armenia in 1968. Graduated from Yerevan University with a masters degree in engineering & cybernetics, he continued his education at Yerevan University, including service on the Faculty of the History of Philosophy. His religious training took place at St. James Armenian Theological Seminary in Jerusalem, Israel. 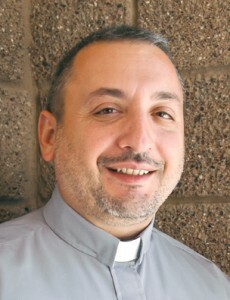 Ordained to the priesthood in the Armenian Apostolic Church in 1994, his work history includes teaching religion and history in Yerevan, Jerusalem, and in Jordan. Also, he spent time as an editor of Kantassar magazine in Yerevan and St. Tateos Monthly at the Prelacy in Jordan. Fr. Zacharia has published his works in Sion Quarterly of Religion in Jerusalem and Panper magazine, published by Yerevan State University. He has also published four volumes under the title Hidden Springs, a collection of sermons. He is also the author of two children’s books, one written for Easter activities and another as Bible riddles. He is married, the father of two children, and lives in Scottsdale, Arizona.